The United States of America sits on a gorgeous continent. Its 3.79 million sq. miles is covered with 60 National Parks (and more than ten thousand State and Local Parks) – wondrous beauties of nature, preserved and protected for us to enjoy. 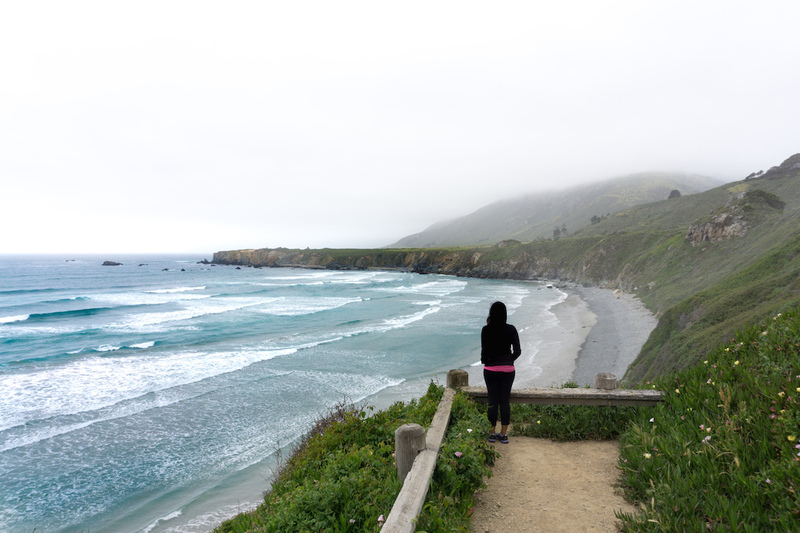 There are various ways to enjoy these national parks, including taking romantic weekend getaways! 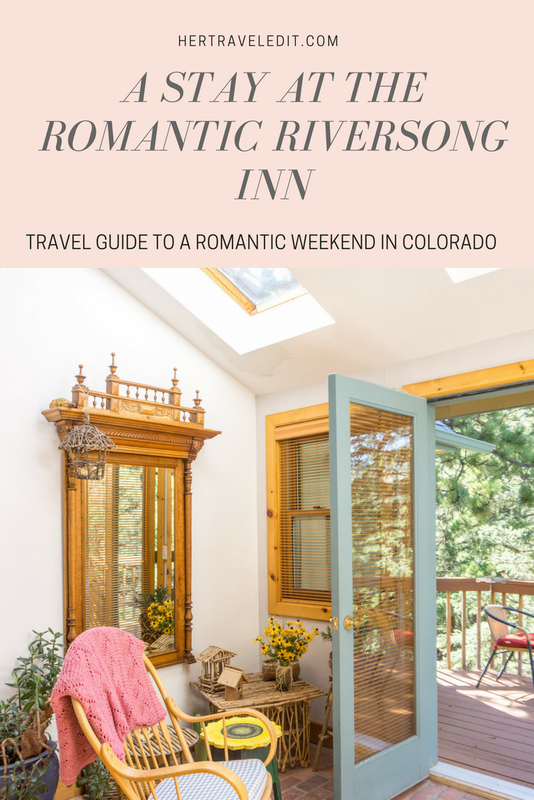 If this appeals to you, keep reading because this post will help you plan the perfect romantic break in the Rocky Mountains in Colorado! The most popular gateway to Rocky Mountain National Park is Estes Park – a mountain town at the eastern entrance of the park. The town itself is cute, the brisk, fresh mountain air making it even more enjoyable. It naturally lends itself to a romantic getaway, the Romantic RiverSong Bed & Breakfast ups the romance a notch. 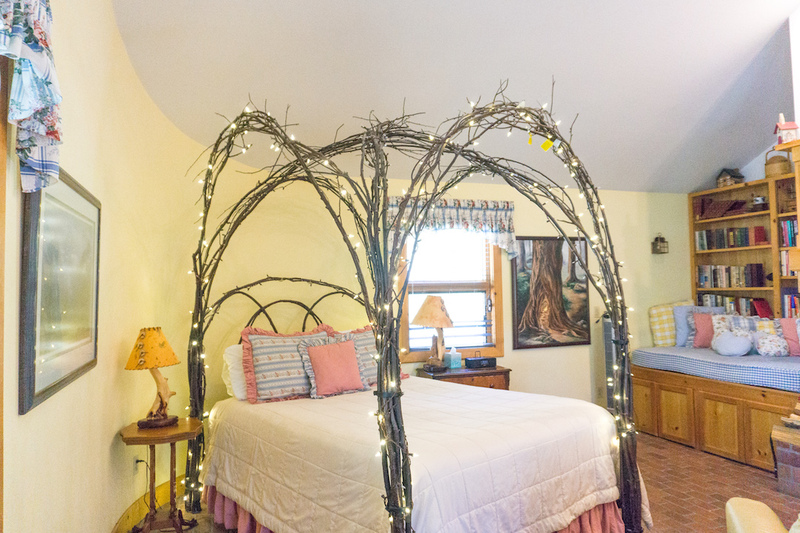 The Romantic RiverSong Bed and Breakfast B&B is set on a 26 acre property at the base of the Rocky Mountain National Park. The property includes a lovely little brook (river song – get it?! ), several fun trails, a giant chess board, loads of bunny rabbits and the cutest cottages that ever did step out of a story book. We stayed in the Wood Nymph room, where the storybook theme stayed true. 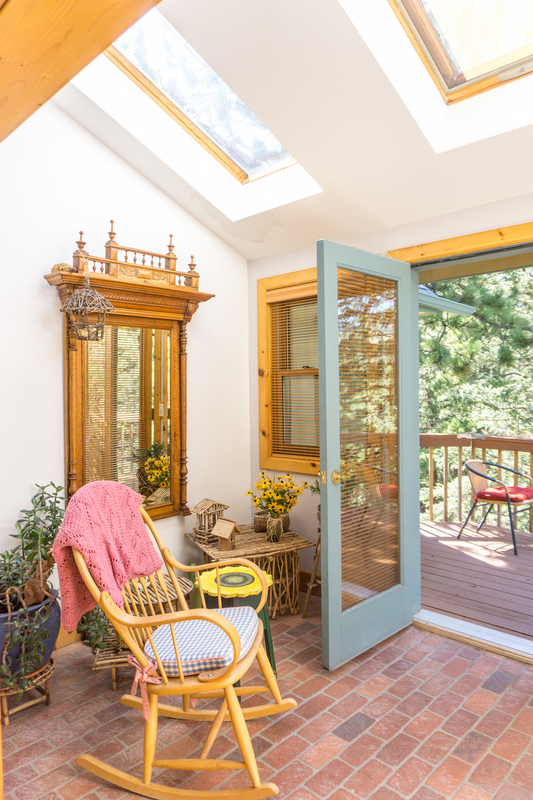 It’s a sprawling room with a whimsical bed carved out of a tree, a lovely little book corner, a large gorgeous bathroom – and the most beautiful terrace with our own hot tub and a rocking chair! We were greeted with a bottle of champagne since they found out we were celebrating our one year anniversary! 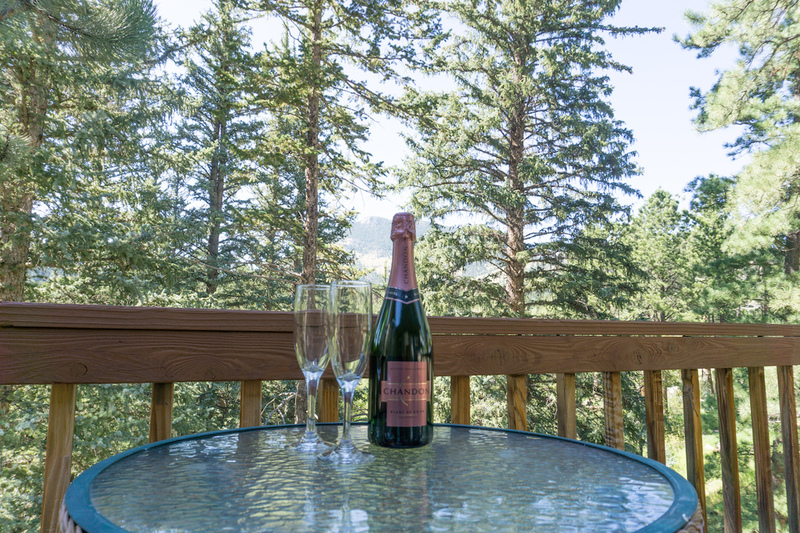 Of course, we enjoyed the champagne on the balcony, listening to the bubbling brook, the mountains peeping at us behind the trees. The cutest tradition of this B&B is that they keep guestbooks of everyone who stayed in the room since it opened – I leafed through the ones in our room and some entries went way back to the 90s! It was so fun to read stories from all the happy couples that stayed here – and then add our own story! I hope we can go back for another anniversary down the line – I’ll spend many a happy hour searching for our entry! 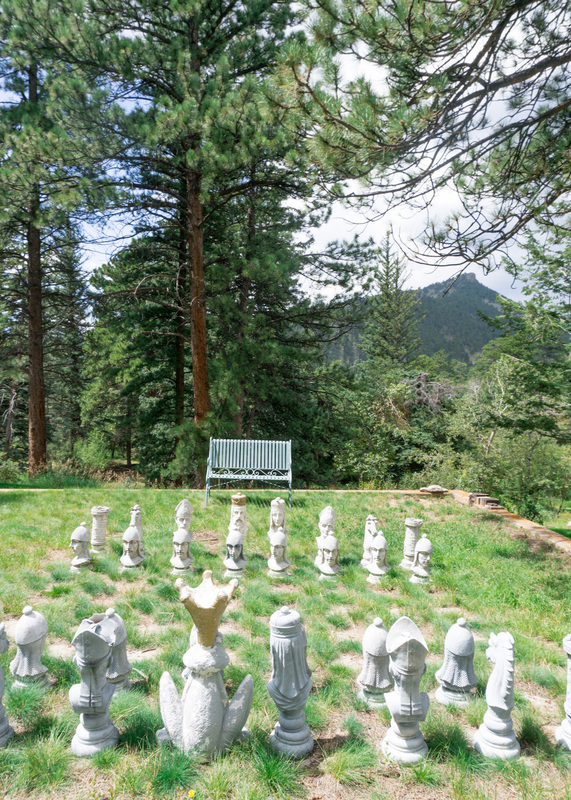 It’s very understandable that you might not wish to leave this property at all, but Estes Park and the Rocky Mountain National Park are well worth a visit. 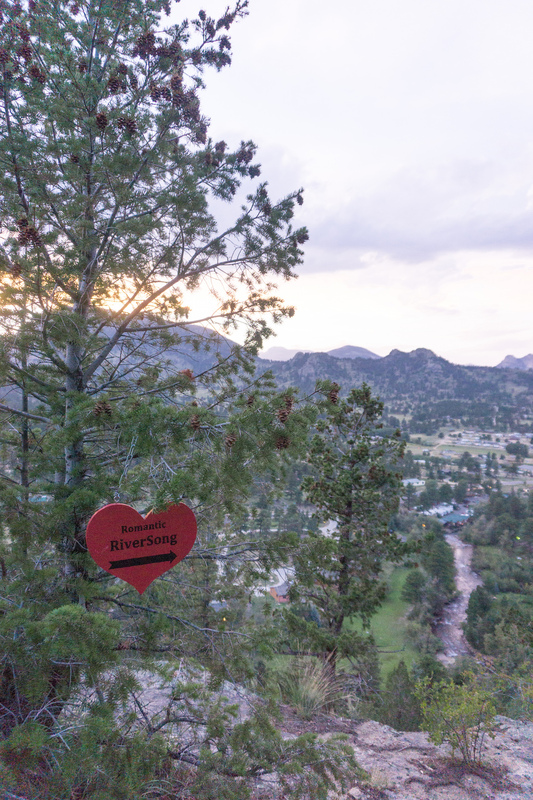 Head to Estes Park in the evening to walk along the river and wind down with some live music with dinner. Mama Rose or Seasoned are a couple of options for dinner on Saturday. The town has quite a lot of public parking including parking lots and street parking. I recommend turning in early on Saturday night to prepare for your absurdly early start the next day. 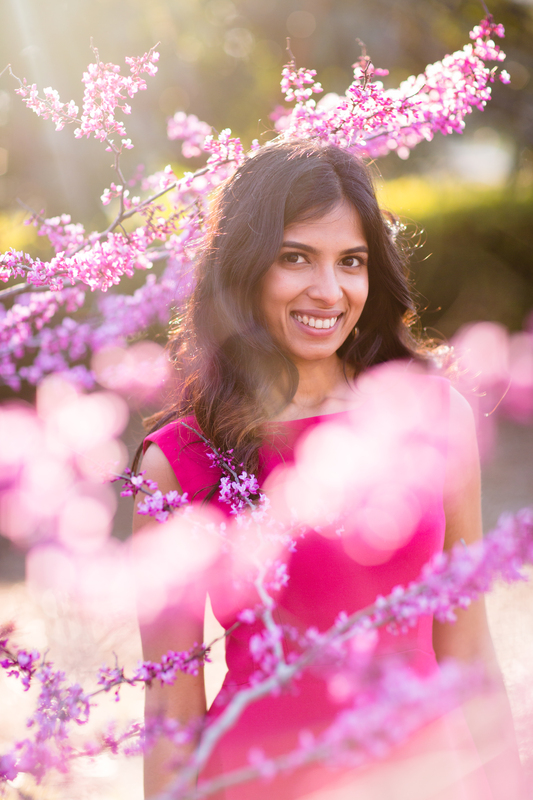 The early start (about an hour before sunrise) might sound counterintuitive to a romantic weekend spent in perfect harmony – it might be the cause of serious rifts in some couples – but I urge you to try it for this one day. It’s not an arbitrary request to test your relationship, but stems from the conviction that watching the sunrise on Bear Lake with a thermos full of coffee, wrapped in a blanket with your love beside you, is possibly the most romantic moment you could ever enjoy. 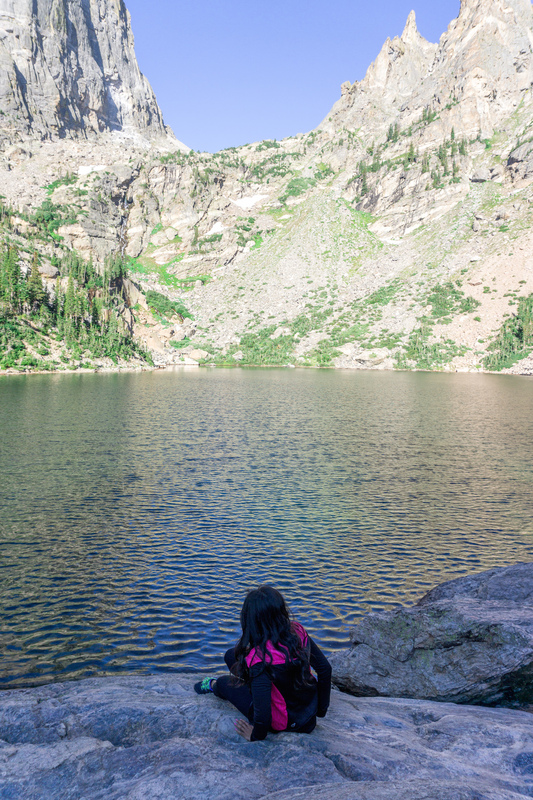 Bear Lake is one of the more popular destinations in the Rocky Mountain National Park, which is already one of the most trafficked National Parks in the US. Sunrise is probably the only time you can get it to yourself (it’s big enough to share with the few photographers and their tripods who will be there). Watching the colors change with the sunrise, the mountains beyond come into view and light up, the birds start singing, and the lake start reflecting – you will write a song about it when you are there (but hopefully not sing it too loud to break the peace). 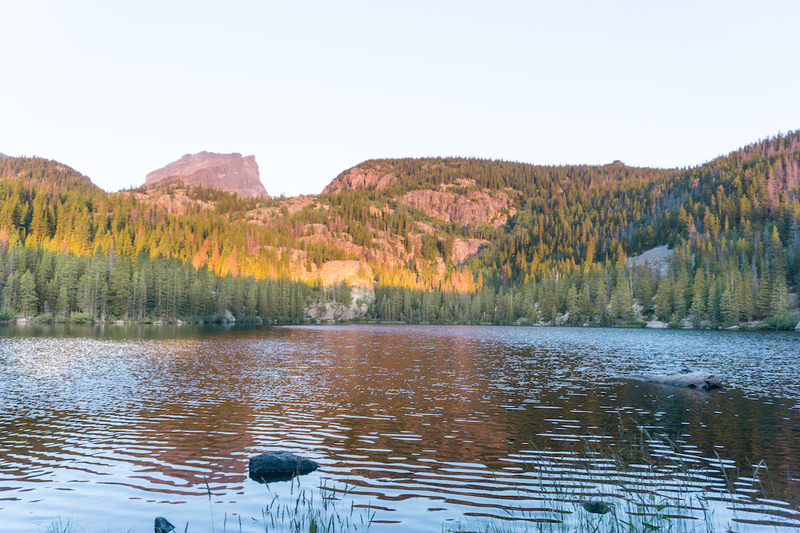 After enjoying the sunrise, pack up your blanket and coffee, and start on the Emerald Lake Trail. This trail takes you past three other lakes, a couple of waterfalls (if you are lucky!) and a few inquisitive squirrels. It’s a decent hike, brisk enough to start off an energetic day, but not hard enough to send you to your bed in agony. It’s also quite a popular hike, so early morning is the best time to do it! After a bracing climb, you will reach Nymph Lake, a little lake covered with lily pads! It’s really pretty and cute, and has a bench at the perfect spot to enjoy some early breakfast. We saw a campsite close by too, so this could be a good spot for some of you more adventurous romantics. Head onwards, climb upwards and enjoy the scenery and peace that the mountains bring you! Once you get to Emerald Lake, turn around if you want to make it back to breakfast at the RiverSong on time (highly recommend breakfast there!). By the time you reach the Bear Lake Parking lot, it will be packed, so give each other an extra pat on the back for waking up early. Then reward yourselves with the RiverSong’s delicious, fresh breakfast and strong coffee. After some much needed R&R, grab sandwiches for lunch from Scratch Deli and set off to the RMNP again. 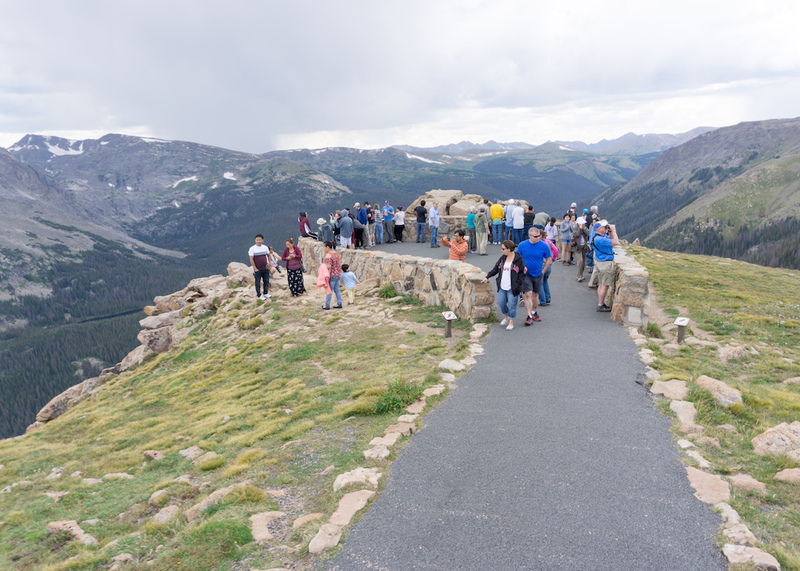 This time, your goal is to drive on the Trail Ridge Road, which is carved into the mountains and goes all the way up to over 12,000 feet before descending on the other side. It’s an awesome drive because you get to see the changing flora and fauna as you go up – and experience a change in seasons too! When we went in August, we could still spot snow in the high elevations! It is explicitly prohibited to walk off the path on these mountains because the vegetation and animals there are endangered and protected. However, as you can see, many arrogant tourists chose to disregard this – for what?! 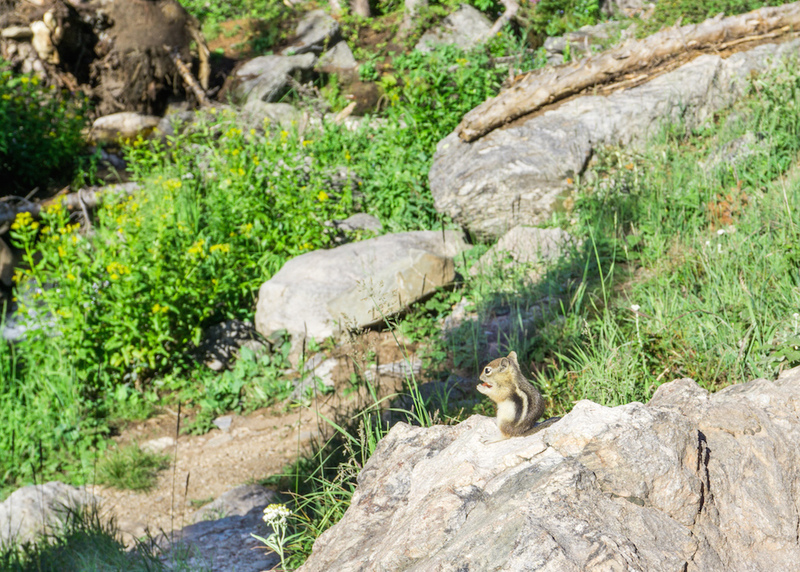 If you visit National Parks, please respect nature and the creatures who live there. We are visitors and must act as such. Do not leave behind anything, and always pay all the entrance and parking fees. At the end of the Trail Ridge Road (which seems to wind on forever, but is in reality about an hour and half long), you will end up in the town of Grand Lake. It reminded me of an old Western film. The lake is usually brimming with water activities, it’s fun to watch and/or participate! Back at the RiverSong B&B, most of you will opt to relax in your lovely rooms, fortunately equipped with private hot tubs. For those feeling a little bit more adventurous, I highly recommend heading up the Seven Benches Trail! This short hike up a hill, named for the seven benches placed at convenient rest distances (you won’t need them, but it’s fun to count!) 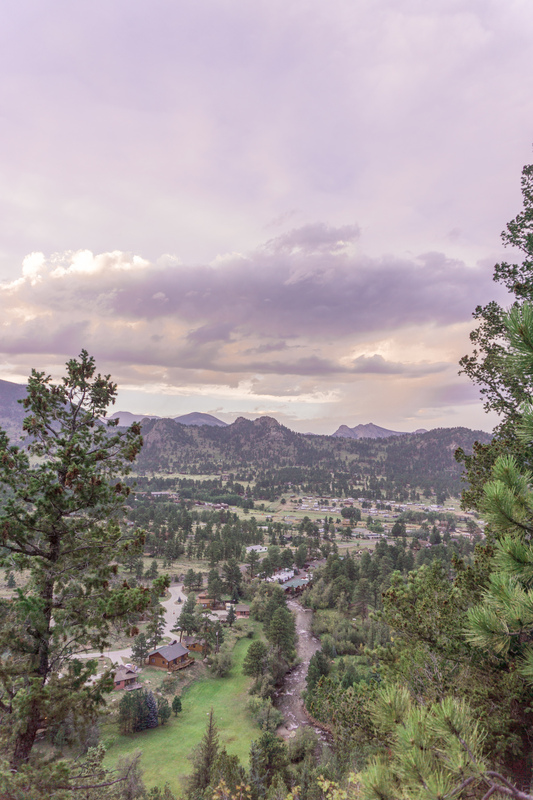 rewards you with gorgeous sunset views of Estes Park. ‘The Hills are Alive with the Sound of Music’ – this song plays non-stop in my head any time I’m in the mountains. 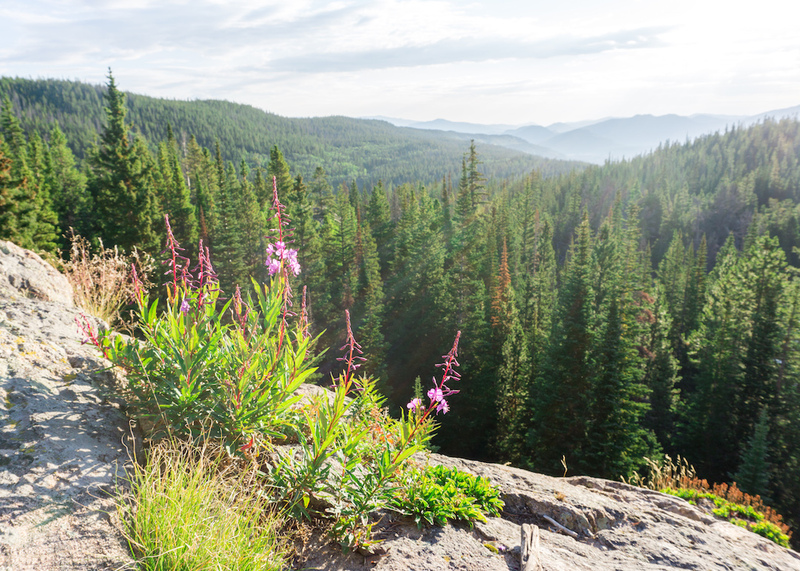 In the Colorado Rockies however, it came to life in the truest sense – our visit there was like a beautiful, bubbly song. I hope that you get to experience this same song – so if you have any questions at all about planning this trip, please leave a comment and I will help you as best I can! Saturday Morning : Arrive at Denver Airport. 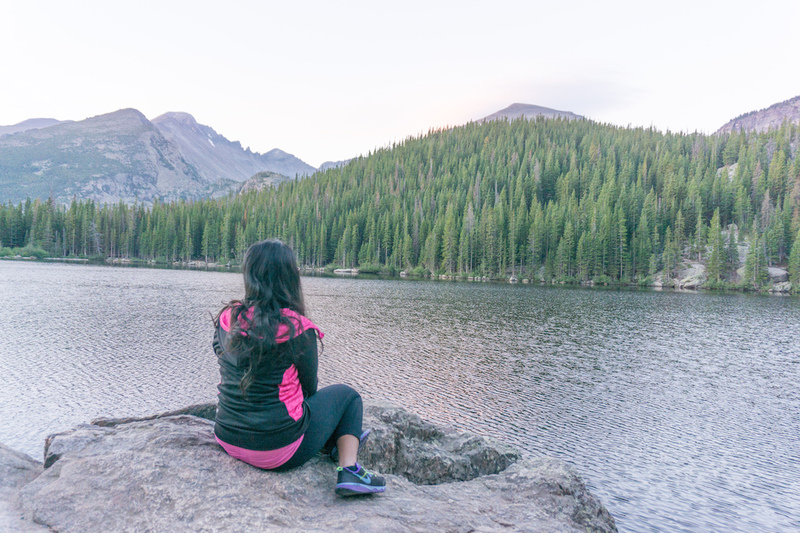 Pick up your rental car, grab a quick bite to eat, and head to Estes Park (about 1 hour 40 mins drive). Saturday Afternoon : Arrive at the Romantic Riversong Bed & Breakfast, marvel at the perfect fairytale you have entered, and freshen up. Either enjoy your lovely room, or roam around the grounds and have tea by the brook. Saturday Evening : Walk around in Estes Park, eat a nice meal. Turn in early in preparation for the National Park day tomorrow. 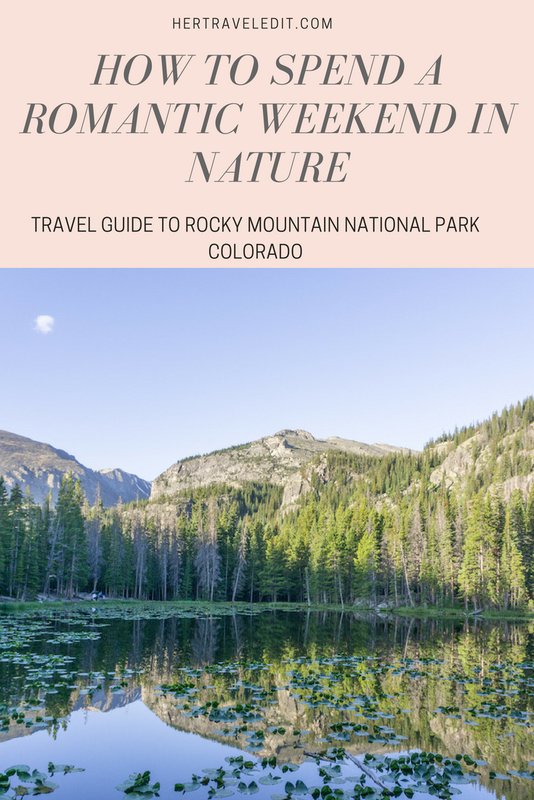 Buy your entrance pass to the Rocky Mountain National Park online. 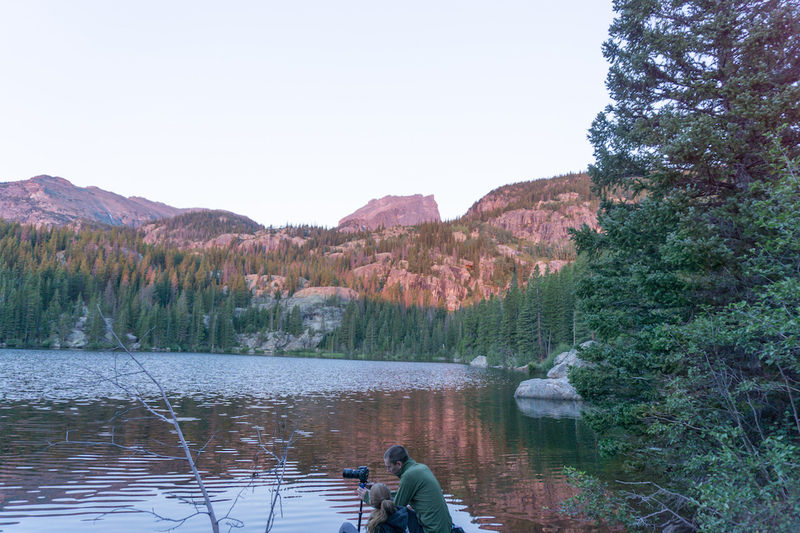 Sunday Before the Crack of Dawn : Head to Bear Lake to watch the sunrise. Pack a light snack and water, possibly coffee if you are into that. The parking lot near the lake should be almost empty at this time (unless a lot of people read this post and overcrowd sunrise. Sorry!) Then hike the Emerald Lake trail to Emerald Lake, passing by Nymph Lake and Dream Lake. Get back to your car just as the crowds are rolling in, then head back to Romantic RiverSong for a fresh, yummy breakfast. Sunday Noon : After relaxing and taking a nap, grab sandwiches and head back to the park. Drive the Trail Ridge Road (make sure it’s open for the season) all the way to Grand Lake. There are many lovely hiking options on the way. Eat your lunch somewhere on the road but please don’t litter. Refuel with coffee and cakes at Grand Lake. Optionally take part in some water activities if you have the time or inclination. 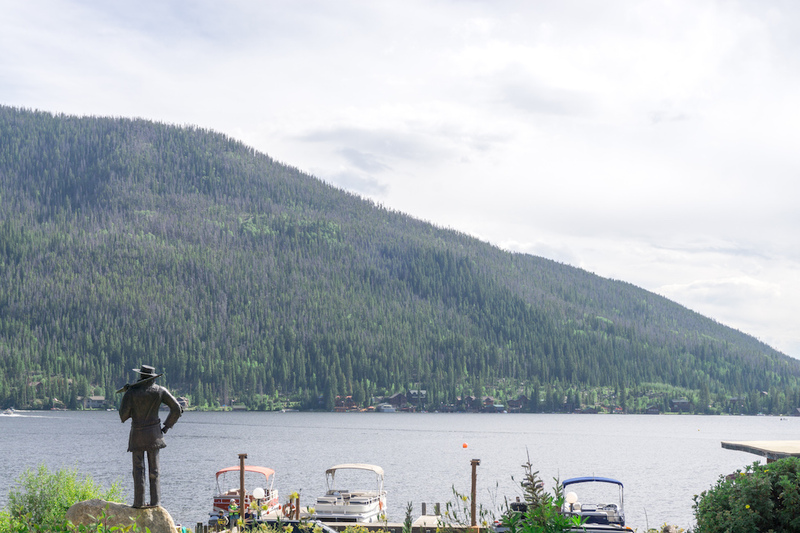 Note : You could choose to drive to Denver straight from Grand Lake (about 2.5 hours), so save this drive for Monday morning if you have a later flight on Monday. Sunday Evening : Spend a lazy evening back at the property, relaxing after your long park day. I highly recommend you do the Seven Benches trail to catch the sunset though – it’s pretty quick, and very scenic. 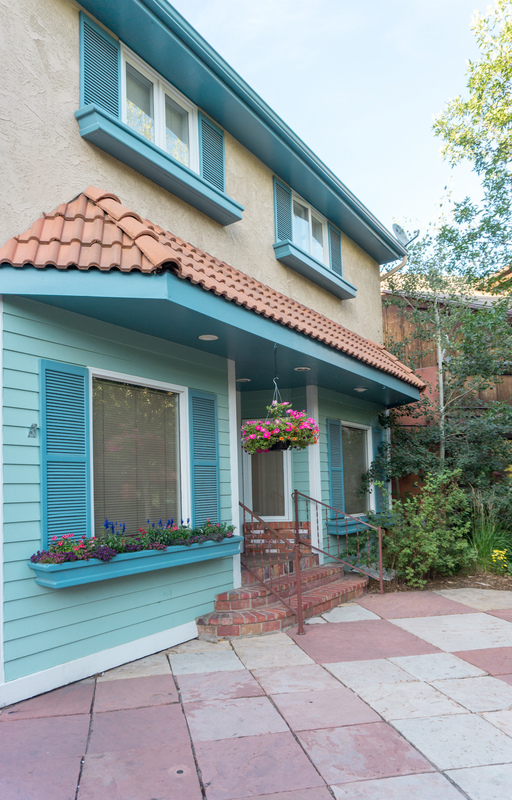 Now, you can either head back to Denver and catch a morning flight back home, or make it a three-day weekend and take a more relaxed drive to Denver through Boulder to catch an evening flight. If you do choose to go to Boulder, definitely visit the Dushanabe Tea Room. It’s an exquisite sight to be seen, and the tea is pretty good too! Not quite ready to book your romantic Colorado trip? Pin this post for future reference! 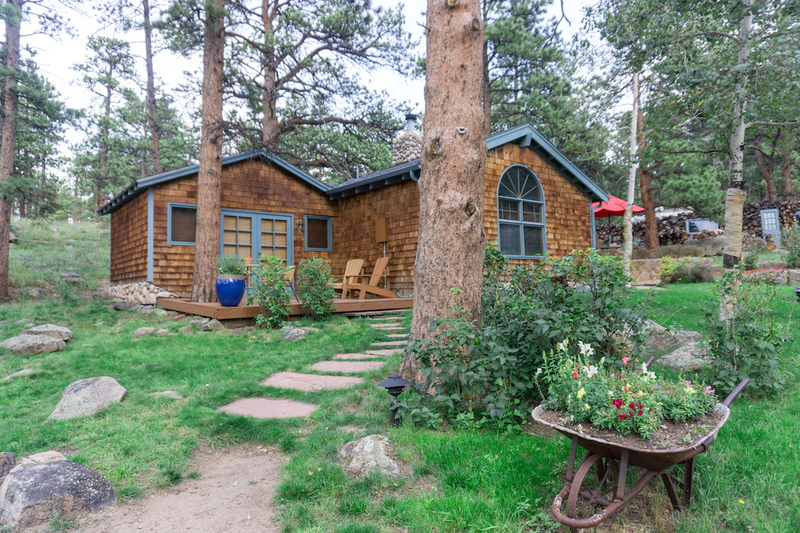 Love love love the look of these gorgeous little cottages spread around the property and you are right that I might never want to leave even with the sights of Estes Park and the Rocky Mountain National Park nearby! I’m so impressed you got up early for the sunrise over the lake! Aww!! Yeah it was hard for us to leave the property as well hehe. 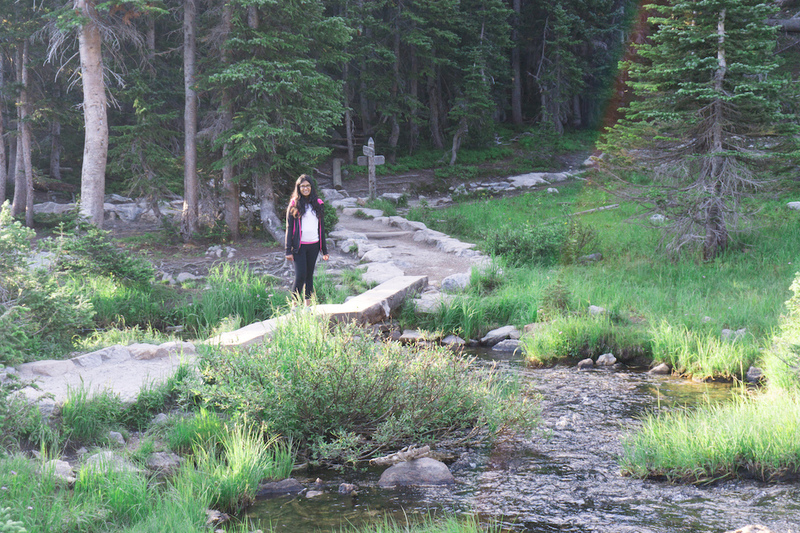 About waking up early…I think you HAVE to do it if you really want to enjoy Rocky Mountain National Park in the summer, it get’s so crowded! Nymph Lake looks so pretty! This is a great itinerary – I’ve only ever been to Denver/Colorado once and that was on a layover. I need to visit for real! It looks amazing. What a great idea and the cottages look so romantic. Thanks for sharing this idea. yes they were so romantic!! 🙂 You’re welcome, hope you experience it someday! 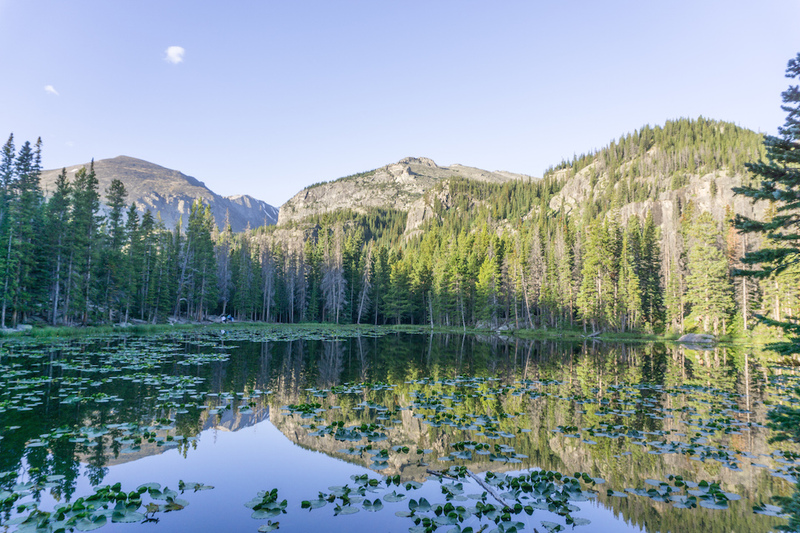 That Bear Lake sunrise followed by the Emerald Lake trail looks like the perfect way to spend a Sunday. I haven’t been to the Rockies since I was really young…this post definitely makes me want to go back and explore more! 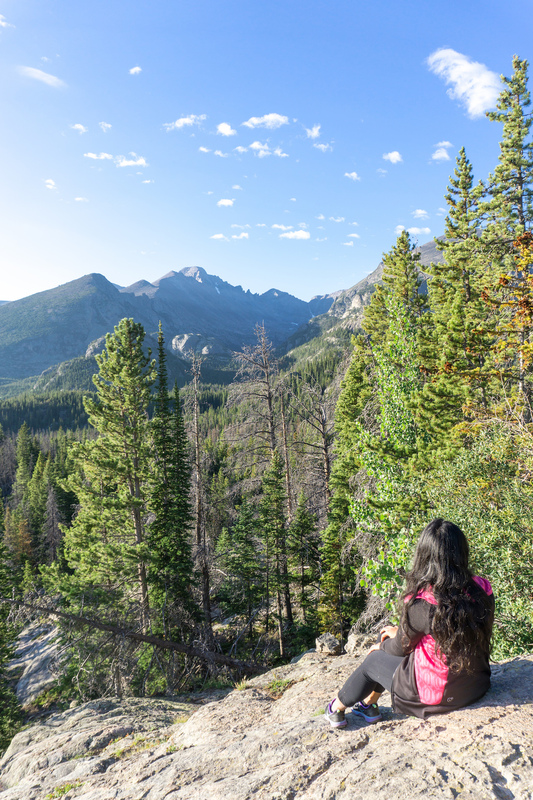 The Rocky Mountain National Park sounds like an exceptional place to explore, Tanmaya! That inn seems charming and when I explore this park, I would definitely stay in there. 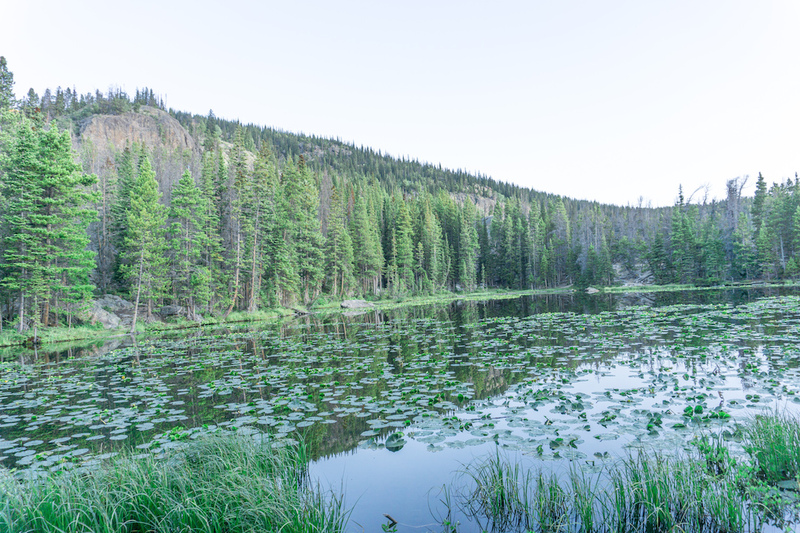 I am so inspired to hike the Emerald Lake Trail! 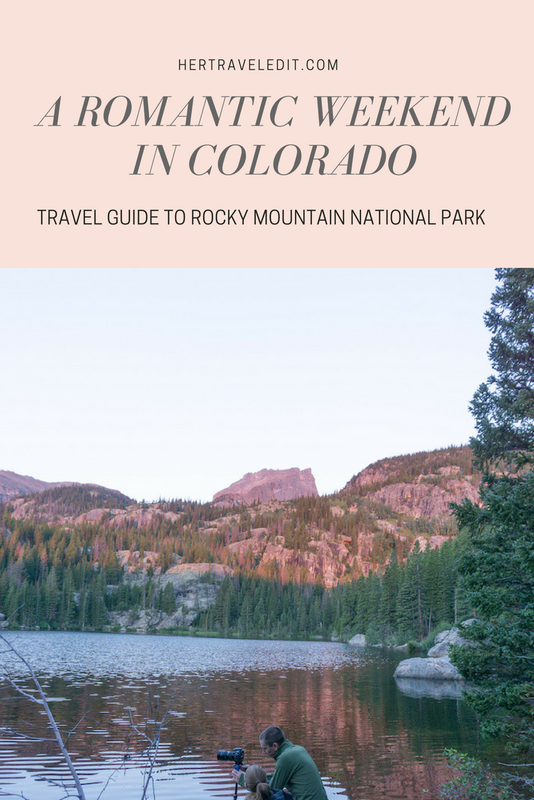 I’m heading to Colorado in two weeks and thought you may have some recommendation!! loves the photos and places you visited. Aww thanks Daowz!! <3 just saw your comment haha, I think we already texted about this!